Commonly known as the blue passionflower, Passiflora caerulea is a twining, flowering vine that grows to 30 feet in length. A fast growing plant, P. caerulea, under ideal conditions, may need pruning monthly during the growing season to keep it from taking over the garden. The good news is that the plant blooms on new growth so the more you prune it, the more it will flower. Save the major pruning for spring. Passiflora caerulea is hardy to USDA zones 8 through 11. Cut any vines that have overrun the support system by pruning them back to the main stem. Remove all dead vines by cutting them to the ground. Cut to the ground any vines that are thinner than the others. Remove vines that are growing together or tangled in the middle of the plant. Try to open up the middle rather than cut growth from the top. Rake up all pruning debris and old mulch, bag it and dispose of it. Apply a 3-inch layer of mulch, 2 inches from the base of the Passiflora caerula and completely surrounding it. 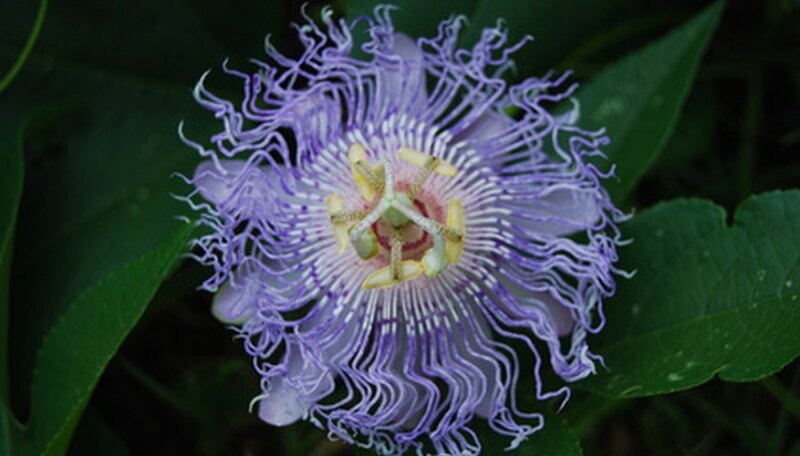 Water the Passiflora caerula until the soil is saturated. Passiflora caerulea may need pruning during the growing season to keep it within bounds. Feel free to cut any vines that are wandering as you won’t hurt the plant.